Vitamins and minerals are the micro nutrients that complete your diet. These are essential and make your body work properly. They boost your immune system and support normal growth and development. Often overlooked perfecting this element of your diet will vastly improve your chances of success in the gym. 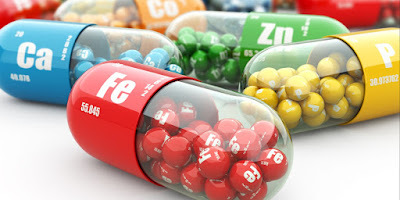 There are two groups of vitamins: fat soluble e.g. A, D, E and K; and water soluble e.g. B and C.
Fat soluble vitamins are absorbed into the bloodstream and stored in the liver. As they can be stored they are not required to be replenished on a daily basis. Whereas with water soluble vitamins you will need a fresh supply daily as they cannot be stored. Each one serves a function and must be present in the correct amount. Minerals also play an important role in maintaining good health and fitness. These are needed on a daily basis and can be obtained from a well-balanced diet. Minerals come in two groups; macro and micro. By supplementing your diet with a pill will have no ill effect and ensure that you are getting enough of each one.